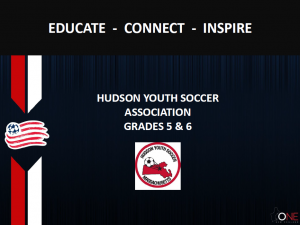 Welcome Grade 5/6 (formerly U12) Coaches to the Hudson Youth Soccer Association! HYSA appreciates your time, effort and dedication to the youth of Hudson and we thank you for volunteering to Coach for HYSA. This is a central location for all Grade 5/6 related documents, links and information. The Hudson Grade 5/6 teams and above play in the Nashoba Valley Youth Soccer League. The Grade 5/6 (U12) games are played on Saturdays. The Grade 5/6 Girls play at 1130 am and the Grade 5/6 Boys play at 1 pm. Home games are played in Hudson at Brook Street Fields. For locations and field directions for away games please see your team’s schedule on the Nashoba League website. Coaches usually hold 2 practices a week with the days and times at the discretion of the coach and the practice field coordinator. Before each season you will be instructed by the U12 coordinator to submit your practice schedule requests. Please get these in promptly to ensure your request is granted. Prior to each season HYSA will contact all Grade 5/6 coaches and schedule a coaches meeting. It is very important that all coaches and assistant coaches attend the coaches meeting. Before each season there is also a Nashoba League coaches meeting. This meeting is mandatory to all new Grade 3/4 and above coaches! At some point, the Grade 5/6 coordinator will contact the head coaches and give them access to their rosters on Sportspilot which is HYSA’s online registration system. Once you have access to your roster you will need to contact all your players and let the parents know they are on your team and let them know what your practice schedule will be. Please always make your first contact of the season by phone. Once you call the parents verify all the information for each player is correct including phone number, email address, players name is spelled correctly. Please ask the parents to make sure the players come to each practice dressed appropriately and with cleats and shin pads. They should also bring water and their own size 4 ball to each practice. You can also send a general information greeting/letter via email to the parents with all the important Grade 5/6 information. Click on this image to download the Revolution Academy Curriculum. Note: Please contact your age coordinator for the password. Make enough copies of your validated team roster for at least the first two games of the season, and keep the original roster in a safe place. (MTOC teams only) Take the plastic sheets of laminated passcards and cut them into individual passcards. Inventory the equipment used by your team and obtain balls, pinnies, cones, etc as needed. Make sure you have enough pinnies to use them as an alternate jersey color if and when your opponent wears the same color of jersey. Make sure you have a pump and at least one needle to inflate soccer balls before and during a match. Contact your opposing coach to make sure game is on. If your team is the home team, make sure your field is open for play. If your team is the home team, bring at least two soccer balls of the right size and inflated properly to serve as game balls. If your team is the home team; fill in the required information (game ID, date, time, gender, age, flight, complete team names, field) on the referee’s game card BEFORE you go to the field. Do not fill in team colors. Take two copies of the CURRENT validated team roster to the game, with jersey numbers of players handwritten or typed on at least one copy. You may remove player phone numbers from your roster copies. (MTOC teams only) Put your deck of passcards in order, coaches first, followed by players in alphabetical order by last name, and take them to the game. Give passcards, two copies of roster and game card to center referee for team check-in. Line up your players in alphabetical order by last name for check-in and safety check of equipment by referee. Wish your opposing coach well before kickoff. Send all substitutes to center of sideline to enter the game. Substitute your players when allowed, and only when acknowledged by referee. If a referee does not see your substitutes when play stops, and your team can substitute, call out “Subs!”. Keep yourself and other players away from center of sideline and at least three feet back from the touchline. Stay in your half of field or inside marked coaches’ area, when marked. Respect the NVYSL zero tolerance policy and set an example of sporting behavior for your players and fans. Pay close attention to player injuries, especially blows to the head. Confirm final score with match referee. Line up your team to shake hands with other team and coaches, and do so. Clear the area of any debris and any personal property left behind by your players. Better still, ask players to do it. As soon as you get home, report the game result to the person designated by your soccer club. A complete game report includes an NVYSL game number, date/time, field, HOME team’s complete name (e.g. Hudson G56B) and score first, followed by VISITING team’s complete name and score. If any yellow or red cards were shown to either team, report this information as well. Complete an on-line evaluation of the referees for your match. If you are the home team, as soon as you learn that your field is closed, call and send email to the opposing coach. To reschedule a match, you need an opponent, referees, a field and approval by the age director. Agree on a tentative date/time with the other coach, as soon as you can. BOTH coaches inform the age director of the agreed upon date, time and place, for director approval. If coaches cannot agree on date/time to reschedule in a reasonable time frame, age director will set the date/time.